Although valued by people who receive care, those who make or influence decisions in areas like finance or business planning do not generally understand the complex nature of caring. 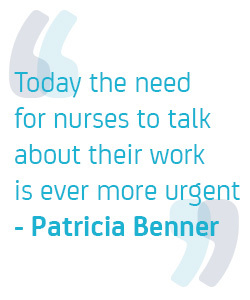 This has led to assumptions being made about the number of nurses needed to care for acutely ill patients and assuming that nursing is not complex work. This is a particular challenge to advanced practice specialist nurses, there are misperceptions about the role. Not only do they struggle with the perception of the finance director but sometimes they struggle to get their worth across to their own nurse leaders. There are several things you can do. You can be descriptive – using things like an elevator speech, talking about your good news story and avoiding some phrases. You can do this by putting together a really simple Service Summary and using other tools which cover key aspects of your service. Doing this will bring together the good news of your service with the bad news of any areas or spend you might need so that a manager can see where to invest to save. You can use this to communicate with managers or even for things like appraisal or revalidation You can also build a Job Plan which shows in detail how you spend your time and the complexity of your work. The important thing to remember is to choose a few things or aspects of the service to evaluate but do them well rather than be inundated with lots of data. You can use things that show quality like patient experience tools, surveys, etc – but don’t forget that any survey should be properly designed to have influence. Does your organisation have the resources to support patient experience work? There are lots of places to find out about patient experience such as Patient Opinion which allows patients to comment on your service.